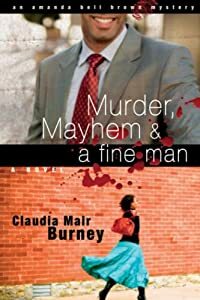 Murder, Mayhem and a Fine Man by Claudia Mair Burney: Synopsis and Online Purchase Options. Synopsis (from the publisher): Amanda Bell Brown knows that life as a forensic psychologist isn't quite as cool as it looks on prime-time TV. But when she turns thirty-five with no husband or baby on the horizon, she decides she's gotta get out and paint the town — in her drop-dead red birthday dress. Instead, she finds herself at the scene of a crime — and she just may know who the killer is. She needs to spill her guts, but not on the handsome lead detective's alligator shoes — especially if she wants him to ask her out. A complicated murder investigation unearths not just a killer but a closet full of skeletons Amanda thought were long gone. Murder, mayhem, and a fine man are wreaking havoc on her birthday, but will her sleuthing leave her alive to see past thirty-five?